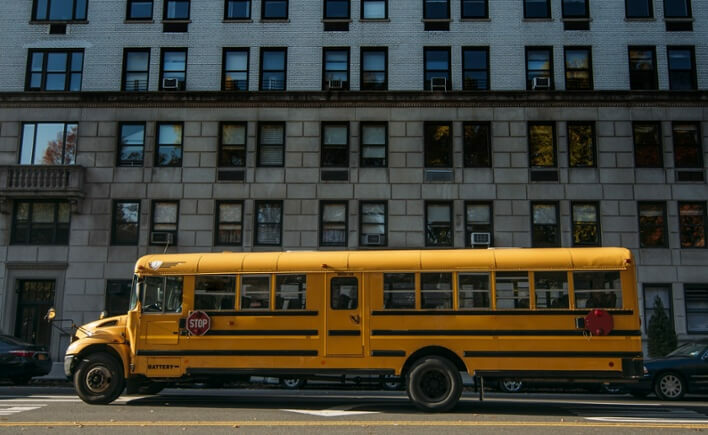 Considering that a school bus can measure up to 45 feet long, it’s easy to understand why routes in urban environments can be tough for drivers. School bus scheduling and routing in cities can also present particular challenges, since buses must compete with dense urban traffic, emergency vehicles, and pedestrians. The good news: managing the challenges of city driving is easily done with sufficient training custom-tailored to your area. When driving in the city, school bus drivers can expect to encounter a high number of traffic lights and cameras. Surprisingly, traffic cameras can contribute to the unpredictability of city driving. According to a recent study commissioned by the Chicago Tribune, traffic cameras routinely cause a 22% overall increase in rear-end accidents. Why? Because drivers slam on their brakes to avoid running a red light, which causes accidents. School bus drivers, and certainly every other driver on the road, must cautiously approach intersections with such cameras. City streets are often narrow, making it harder to maneuver a bulky school bus. An added difficulty is that many cities are planned on a grid layout — and include a number of one-way streets — which can complicate navigation. The number of pedestrians in the city is another challenge for school bus drivers. Jaywalkers are especially dangerous — even more so when visibility is limited by parked cars, buildings, or other obstructions. Emergency vehicles are another topic that must be included in your school district’s city driving training course. All drivers should know the procedures they must follow when encountering an ambulance or other emergency vehicle. Driving a school bus in a crowded city presents a wide range of unique challenges. The key to successfully navigating dense city streets is to always drive defensively. Drivers must be conscious not only of the physical urban environment — including tight roads, frequent traffic lights, and heavy local traffic — but also the unpredictability of reckless, hurried, and distracted drivers and pedestrians.